Start a meal page to easily organize a group gift of dinner. Invite friends, extended family, and co-workers to give home-cooked love. Add a message and upload a photo (optional). Share by email, Facebook, or any method. Donors can add a message, remain anonymous, and give as little as $10. Set your notification date a few days in the future to give time for friends to give. The morning of your notification date, we'll send an email and text (optional) to your friend of their gift. You'll see the status of your notification email on your admin page (e.g. Sent, Opened, or Bounced). You'll get notified if your email bounced or is unopened after a few days with the option to resend. Q: What if I already have a meal calendar? A: Great! Add your meal page link to your existing calendar as another option for busy or out-of-town friends who can't make and take a meal over. Q: Is a group gift better than a regular gift? A: If multiple people are contributing, everyone will find a group gift much easier. Q: What happens on the notification date? 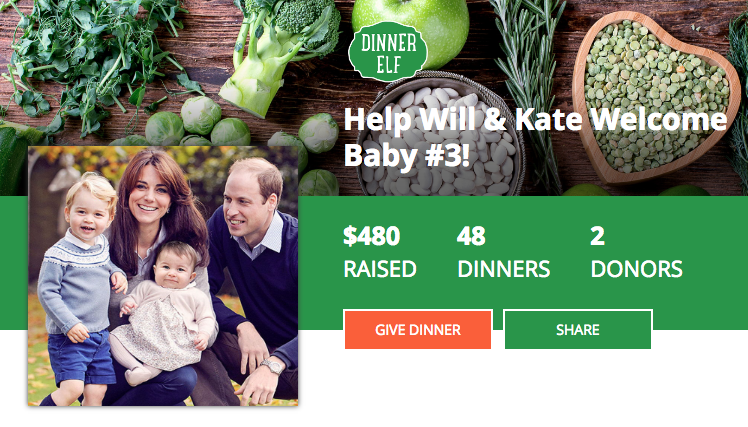 A: The total raised from their page will be added to their Dinner Elf account. They'll be emailed with the good news and instructions for ordering. Q: Can I notify my recipient now? A: Yes, just change your notification date to today. Q: Can donors give dinner after the notification date? A: Yes, additional donations will get added to your friend's account and they'll be notified by email. Q: Donors have exceeded my expectations! Can I turn the page off? (b) click "Hide page" from your group admin page (they'll see this page). Q: How can I find my admin page? A: A link will be included in all emails sent to you. Or, log into your account, click "Give Dinner" at the top, and then click the pencil next to your group gift. Start your group gift today! Still need help? Get a quick answer! Get a quick answer!